Samsung knows that CES is a big show to be at each year, and this year, they do not intend to disappoint, either. In fact, the South Korean consumer electronics giant intends to roll out a new range of audio dock systems which will boast of breakthrough innovation that delivers rich sound qualities that are comparable to premium audio systems. These audio dock systems will also be easy on the eyes – pleasing, even, as they have been stylishly designed in order to look right in place regardless of what your home’s internal decoration and set up looks like. Samsung’s Audio Dock with Vacuum Tube Amplifier is touted to be the world’s first docking system which will incorporate Samsung’s proprietary hybrid vacuum tube amplifier technology, while being able to play nice with the wide range of Galaxy S and iOS-powered devices through the use of its dock, and you also have the option to go wireless with the DA-E750 model. More to come right after the jump. 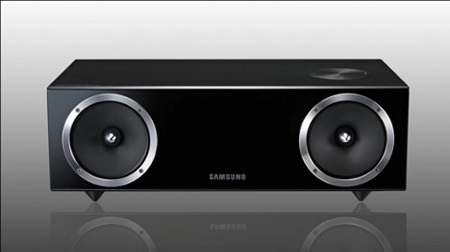 The Samsung DA-E750 Audio Dock, as mentioned above, is the company’s first speaker dock and features Samsung’s exclusive hybrid vacuum tube amplifier technology. This will let your ears enjoy a digital amplifier’s sharp clarity alongside the rich and warm sound performance of vacuum tubes, ensuring that even the most demanding (OK, maybe not so) audiophile will still be able to enjoy what they deem to be “a pure listening experience”. Vacuum tubes amplifiers used to be in premium audio products previously, but it has now arrived in the mainstream without requiring you to break the bank. Capable of supporting both the Galaxy S smartphones in addition to iOS devices such as the iPod, iPhone, and even iPad, you get a 2.1-channel speaker and powerful built-in subwoofer with 100 watts of sound. Not only that, there is an analog (composite) input and a USB port which will enable yu to play audio files straight off a thumb drive, music player or portable hard drive. Supported file formats include MP3, WMA and WAV. No idea on pricing just yet though, so hopefully CES 2012 will shed more light on the situation.